Stream or ocean-side wader repair can now be accomplished by a small host of products but one in particular has gained my confidence. 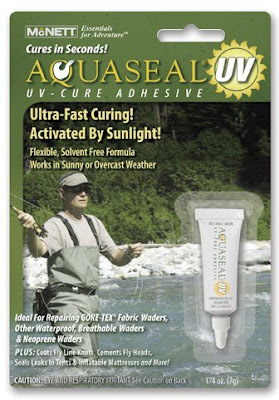 It's Aquaseal UV® and it cures in seconds when exposed to the sun. This product is a solvent free formula and works in both overcast or full light conditions. The folks at McNett claim that the only thing stronger than Aquaseal UV® curing adhesive is regular Aquaseal (included in some wader repair kits). Note that both of these products are also ideal for addressing broken stitches on wading footwear and for sealing neoprene holes/cuts/tears. Check both of these repair products out because a little care and maintenance can keep your gear functioning better longer. yeah, that stuff works great. I've used it. I've been impressed.